A portable, wireless mic records to your iPhone or iPad, designed for podcasting, interviews, and music. Capturing good audio isn’t easy. But it’s essential if you’re recording a new track, producing a podcast, or chatting over Skype. If you don’t know the first thing about what makes for a good microphone it can be a long and exhausting search. Even if you do know the ins and outs of recording, you have to contend with cost and possibly multiple pieces of equipment depending on how extensive you want your setup to be. And then those wires. So many wires. Austrian entrepreneur Philipp Sonnleitner thinks he has the solution. 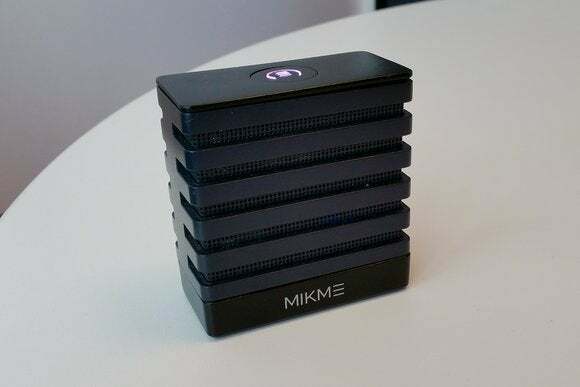 His new, wireless microphone Mikme, which goes on sale Monday, promises studio quality recording in a small but sturdy package. The rectangular prism sells for $169 through its Indiegogo campaign. The Bluetooth-enabled microphone can record up to 180 hours of audio on its 8GB of internal storage. The device records at 24-bit audio resolution with a sampling frequency of up to 96kHz. Mikme is also designed to pair up with the its companion iPhone app, which has a simple, Instagram-style layout for quickly mixing how the audio sounds. When the mic is connected via Bluetooth, your audio can also be saved to your iPhone. During a recent demo I was impressed with how Mikme performed. I’m not a musician, nor any kind of professional critic of sound quality. But when Mikme played back a variety of recordings, ranging from interviews to music, I was impressed. Sonnleitner told me during the demonstration he spent eight years working for a large hardware maker in the sound industry, but was frustrated by the lack of innovation and forward thinking in terms of how equipment should integrate with popular technology. Designing a device that worked well with an an iOS app and Apple devices has long been his vision, but something he only felt he could bring about on his own. “I was completely bloodied because I could not push through my ideas. I was not so much interested in just microphones. I spent spent lots of time reading tech blogs and finding out what was next,” he said. Mikme offers several in-app upgrades for various audio effects. The light, portable Mikme should appeal to journalists, who could record interviews, and Sonnleitner recently tested it with musicians in Southern California, where it handled being placed on grass, knocked around on tables, and splashed with beer—and still keep going. One test model he used had obviously survived a rough road trip, but I didn’t notice any kind of downgrade in quality. That’s by design. One of the envisioned use cases for Mikeme is musicians who perform gigs and want to be able to make a recording from the club without worrying about how their microphone will hold up. But Sonnleitner also is targeting podcasters, bloggers, or anyone else that is looking for a simple setup when it comes to recording and playback. The iPhone app is already available in the App Store (a version for Android is coming later), and it works with the iPhone’s internal microphone so you can test out what it’s capable of. The app has several mixing options, which you can easily manipulate by moving a dot around with your finger. The sound options are arranged in much the same way as filters in Instagram—just one touch to try one out. Add-ons for more sophisticated sound mixing are available as in-app purchases. Sonnleitner says a connected app for iOS has always been part of the vision for Mikme. He counts himself as a longtime fan of Apple products and the tight integration with devices and applications. “I like that holistic view of software and hardware planned together,” he said.